Our practice, Gustafson Morningstar Dentistry, offers family dentistry, cosmetic dentistry, and many other cosmetic dental services. If you have a family and are looking for a local family dentist in Royal Oak, give us a call at 248-541-8770. 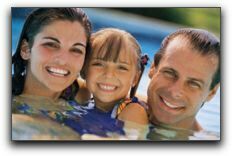 If you live in the Royal Oak area, it is wise to choose a local practitioner for your family dentist in Royal Oak. It will be easier and more convenient for every member of your family to come in for regular examinations and cleanings. Most busy parents don’t need the additional hassle of a long commute to a dental appointment. And what if you experience a dental emergency? A local dentist who knows your family is best equipped to handle any unplanned dental needs such as a chipped tooth or a broken crown. In addition to basic preventative dental health services such as fluoride treatments, routine x-rays, and oral hygiene, we offer cosmetic dentistry, dental implants, and dentures. In an emergency, you can reach Gustafson Morningstar Dentistry at 248-541-8770. Parents with infants and toddlers often ask us about issues such as thumb-sucking, the health of baby teeth, x-ray safety, and fluoride supplements. Parents with older children are often concerned about sealants, tooth protection for sports, tooth straightening, and dental financing. If any of these issues or topics have been on your mind, ask our professional staff for more information. We would be more than happy to give you all the information you need to make the best decision for your dental health. We look forward to answering all of your questions. You can learn more about Gustafson Morningstar Dentistry on our website. Schedule your appointment with a professional dentist in Royal Oak.